I have attatched a bluetooth trace whilst running the connect command above. Hi there, I'm getting an error RuntimeError: Error initializing the API (64) when connecting to my MetaMotionR. From looking at the code, 64 is STATUS_ERROR_ENABLE_NOTIFY, but not sure what that really means. Which platform are you running MetaBase on? Does resetting the BT adapter fix the issue? How long does it take before this error appears? Hi Eric, thanks for the quick response! Metabase is running on iOS. The code is running on Raspbian, very Ubuntu-like. Soft-resetting it indeed makes the initializing the API error disappear, but since soft-reset now it just hangs indefinitely on connect. Perhaps relatedly, I've also intermittently seen Failed to write value to characteristic(Error trying to issue command mid state) errors, that also seem to disappear when soft-resetting. Luckily, Metabase appears to work perfectly fine - can connect, get accelerometer data, etc. So it appears something's up with the API, perhaps with PyWarble / liblepp? Looks like I'm fundamentally misunderstanding something here, but I'm not sure what. And apologies, this should have been a new thread! I blindly hijacked someone else's, a bit rude. # "Failed to write value to characteristic(Error trying to issue command mid state)"
Am I just missing something obvious here? Today I was logging and downloading data from three sensors without an issue for around 40 mins before one sensor starting giving the "RuntimeError: Error initializing the API (64)". Once a sensor starts giving this error it seems to continue to give it. I'll try to replicate these issues when I can. It seems like other users are also seeing issues with the Linux ble code. We have also seen this issue a few times on Linux (RPi), usually when trying to communicate with multiple sensors simultaneously. A few reconnection attempts usually resolve it. If it helps, I can also reproduce by running the stream_data.py example code. I can run python stream_data.py once, and it works just fine. If I try to run it a second time - immediately afterwards - it just hangs on connect. If I soft-reset, then I can run it again. Also tried upgrading to the firmware 1.4.4 but unfortunately same issue. Please don't update firmware via our Python script/example. We have actually removed the update_firmware.py script from the Python repository. You can only update firmware using the latest Android and iOS MetaBase App (and you should do so asap). @Laura any thoughts on what the issue might be? The underlying issue is with how the libblepp library is used. We are still looking into it. 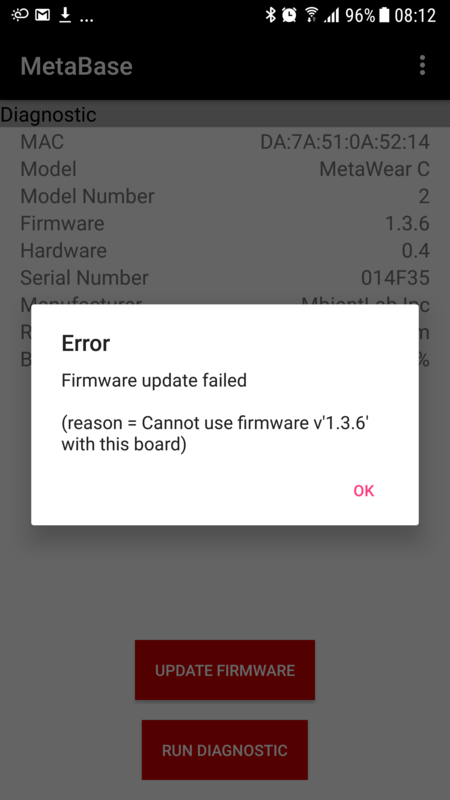 v1.4.4 is not supported with your board. Is there perhaps a previous version of libblepp that's known to work? I installed the latest master version, perhaps being overly optimistic. @Eric - Thanks for clarifying! Just checking in - any news / progress here? I have not been able to replicate the init status 64 error in my VM or on our Pi. I added a trace to my first post on this discussion, if this is not useful then I can get another. In terms of recreating the error, it seems to happen mostly when trying to initiate connections to multiple sensors. I did a fresh ubuntu install and tried Python examples using Python2 and Python3 and everything worked like a charm. I updated the tutorials as such: www.mbientlab.com/tutorials. It might help a few folks here. we are working since couple of months in a project with Python (linux) and we are struggling with randomly connection problems with multiple boards and cannot determine the origin of the issues. Have you tried to connect multiple board to one BLE dongle/multiple BLE Dongles (we are experiencing connection probems here too)?